You are looking for a very special present or you would like to spoil yourself with a maritime instrument that is in a class of its own? 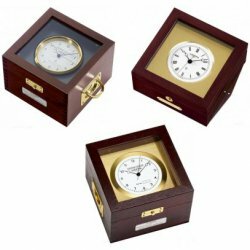 The WEMPE chronometre will surely satisfy your needs completely and presents itself in an elegant mahogany casing. The WEMPE chronometre has a quartz movement which is battery operated and it is equipped with a white dial measuring Ø 95 mm on a polished brass plate. The 3.5 kg WEMPE chronometre meets the inspection requirements of the former German Hydrographic Institute (now BSH) and is convincing as an electronically precise timekeeper, which continues working without interrupting its motion when the battery is changed. Alternatively there is the WEMPE ship's bell clock PRO, a very attractive timekeeper in a massive mahogany casing. The white dial measures Ø 80 mm, the ship's bell clock is delivered with a battery-powered quartz movement. Thanks to the protruding casing base, the instrument can be mounted anywhere. The WEMPE Ship Clock PRO is also an attractive eye-catcher as a desk clock. This ship's bell clock comes with a certificate of accuracy as well.